accommodate the bin can also hire them. 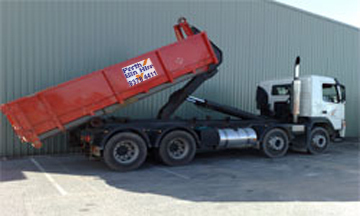 What are Hook Lift Skip Bins? What Hook Lift Skip Bin Sizes are Available? larger sizes able to fit as much as 30 trailer loads of rubbish. Click here to see all the sizes available. What Rubbish Can be Put in Your Hook Lift Skip Bin? What Rubbish Can’t be Put in Your Hook Lift Bin? So there you have it, skip hire has never been easier! Available for hire in the Perth metropolitan area, our Hook Lift bins are popular with both commercial and residential customers. We’ll deliver your bin directly to your home or business, and once you’ve loaded it up, following the above guidelines, we’ll pick it up, sort it, and make sure your trash is disposed of correctly.